Hey! I hope you’ve had a great start to 2015. I didn’t wish you guys a happy new year sorry. Well I wish you a happy new year and I wish my lovely readers all the best for 2015. Today I’ve got an outfit of the day for you,I love this outfit. Guys I’m sorry to break it to you but I’m wearing black again oops. 1. 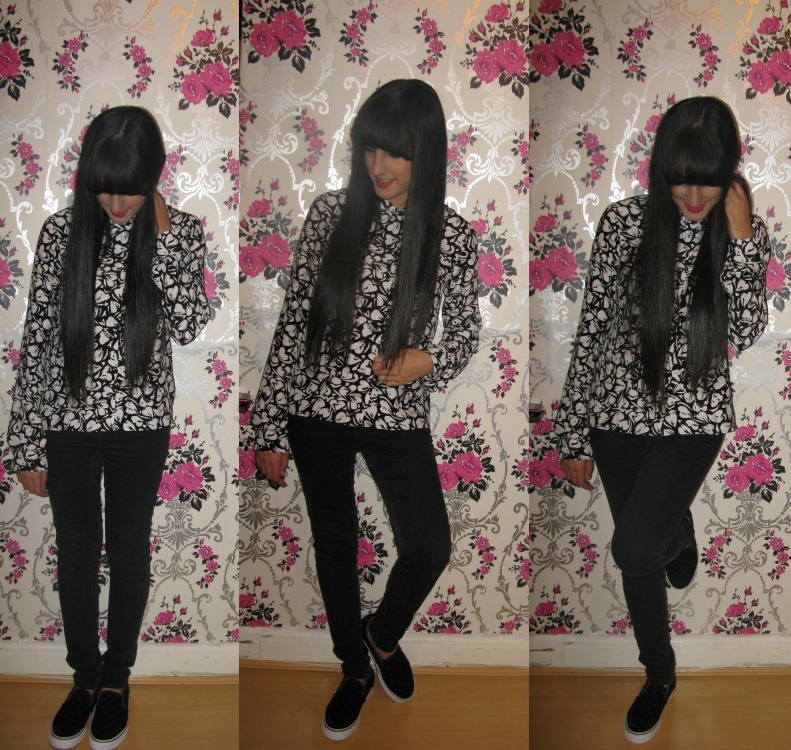 Black and white heart collared shirt – Next. I can’t find the link for this but I’m sure you can get it in store. 2. High Waisted Black Jeans – Topshop. These are my absolute favourite I wear them nearly all the time. 3. Checkerboard vans – Vans. I bought these very recently I love them the suede effect is so nice – they are the most comfiest shoes ever. 4. Maybeline 14 hour super stay red lipstick – Boots. I don’t usually wear red I’m more of a pink person but I love this and how it looks on. 5. Rimmel London scandal eyes eyeliner – Superdrug. My favourite eyeliner the tip is thin which makes your eyeliner precise and its very easy to apply. If you want more of these posts leave it in the comments. Thank you for reading guys love you all -stay sassy. « Blogmas [day 25] // Merry Christmas! Omg you’re 16?! Again, how beautiful you are! And I like your style. btw I saw your facebook profile, and I tried to follow you but I can. How can I?